While the wildlife of the region will make the heart of every nature lover beat faster, the towns and villages in the surrounding areas are just as exciting. Open air events staged in baroque settings in Fulda and regular events conducted in regal style Bad Kissingen are just two examples of the region's cultural diversity, while heritage trails, museums and significant and outstanding examples of architecture from different eras set in the magnificent countryside attract visitors from all around. The region is also justifiably proud of its culinary specialities. The excellent wines of Franconia and sassy liqours of the Rhön are well known throughout the land, and the region's hearty stone-baked bread and tasty sausage delicacies are produced using locally sourced ingredients. 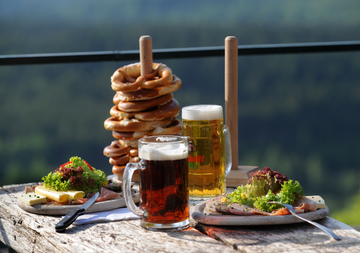 Make sure you don't miss out on these treats, all served with a pinch of Rhön style! Try them for yourself - you'll be surprised at how much this unique region has to offer. Of course you can receive plenty of information on the regional culinary are when contacting us via email or phone.